Only 37 in stock. Order now! We also have a selection of Basic Starter Kit, Deluxe Starter Kit, Ultimate Starter Kit that utilize this module. Finally , look at the back of the module .All of the chip in the module have been burnish , maybe the author want to prevent the designed from plagiarism. But ultrasonic ranging module is nearly the same principle, so it's not hard to speculated that the role of the chip â€?I'm sure at least one 74series chip on it ; ) . It is not a difficult task to crack it , but â€?it's at so low a price , even cheaper than your copy. It interfaces well, but if you block while waiting it does use a lot of processing time. With very little work you can get it working on pin change interrupts then its absolutely brilliant! I have also constructed a table of temperature to speed of sound and by measurement can get better that +/= 10 mm resolution, did not expect this from such a low cost device. My Arduino sketch takes the height and radius of a cylinder in centimeters, and outputs a fluid level in liters. The concept here is for a cistern. It tells you how many liters of water are left, by bouncing a signal off the surface of the water. This inexpensive sensor was easy to use and very accurate. A low-priced and certified product, ultrasonic distance measurement is accurate. The only defect is that the ranging distance is just between 2cm to 500cm.The longer distance will be fine. Perfect! A good ultrasonic ranging module, it makes my toy more powerful! Cool! An accurate measurement device! It is very easy to use. In addition, it is moderate in price. It was very easy to set up and use with an SainSmart Uno board. 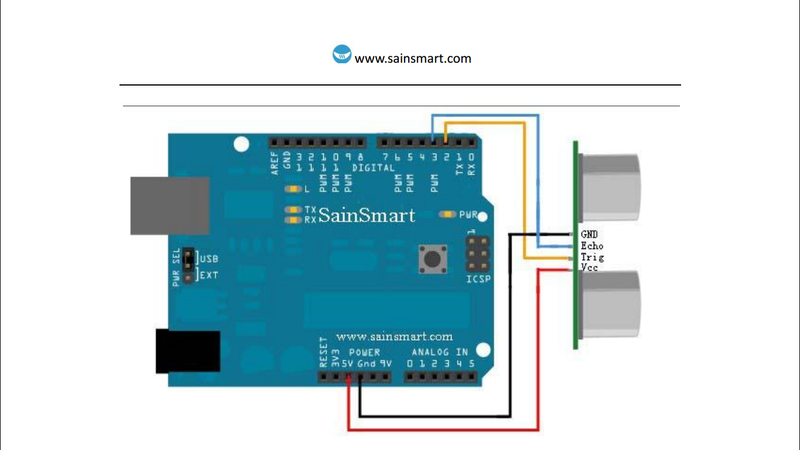 (Make the following connections from the HC-SR04 to the Arduino, respectively: VCC to 5V; GND to GND; Trig to any digital output; Echo to any digital input.) It was somewhat unstable using the Arduino 5V when running off USB power (it would fluctuate and even dip to a 0 cm reading for no reason), but this was fixed by using a 9v/650mA adapter, instead. I am working on a little project and needed sensor to detect when an object was approaching. I decided on the HC-SR054 coz it was cheap. Upon receipt, I plugged it directly into the LCD4884 and had it working within 5 minutes based on the included library. Works perfectly and a great price.